Notes The first and only lava-themed course. 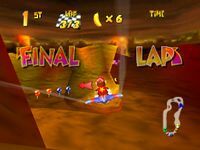 Hot Top Volcano is the fourth track in set for Diddy Kong Racing and its DS counterpart. This track is the first in the set to use a plane as its default vehicle. 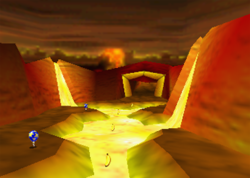 Despite being a volcanic stage, the player can use both planes and hovercrafts when racing on it. Cars cannot be used. The course begins with a sharp drop. There are two red balloons and two balloons only planes can reach. Some bananas are found behind the rock structure. Then, there are two tunnels; on the right, there is a blue balloon both hovercrafts and planes can reach. Hovercrafts fall into the lava after this. Planes can collect red balloons on the main left path, but they can also collect some bananas on a narrow corridor on the left. There is a large slope after this with a red balloon on the left and a blue balloon on the right. Hovercrafts enter the lava after a sharp downward slope. Planes can use a dash ring on the left. An arch is found here with two red balloons on the left and two blue balloons on the right. Soon, there is a turn to the left, leading into another room. A green dinosaur roams in this room, being an obstacle. There is relatively rough terrain. Players can opt for balloons and dash rings on the sides of the room or for bananas in the middle. After an archway, racers complete the lap. The player propels Diddy's Plane for startup. Diddy enters a tunnel which leads into the cavern portion. Diddy in the cavern portion. The left path in the tunnel. At the wide left path. At the entrance of the last room. In the penultimate dash ring. In the last boost ring. This page was last edited on December 18, 2018, at 18:12.